This Salvatore Ferragamo Metallic Grey Satin Mini Sofia Crossbody Bag is no longer available. 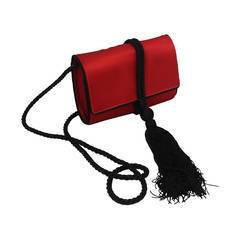 Carry this gorgeous Salvatore Ferragamo creation wherever you go and make people drool. Meticulously crafted from metallic grey satin, this bag has been styled with a top handle, a removable shoulder strap and a leather interior to hold your necessities. Includes: Original Dustbag, Info Booklet The Luxury Closet is an elite luxury reseller specializing in the buying and selling of new & pre-loved designer handbags, shoes and fine jewelry. Founded in 2011, the company is headquartered in Dubai and stocks more than 22,000 items ranging from luxurious wardrobe classics to sleek accessories from leading brands such as Louis Vuitton, Chanel, Van Cleef and Arpels, Cartier and Rolex. Our authenticity experts ensure that all our items are 100% original, and we also offer a lifetime authenticity guarantee. 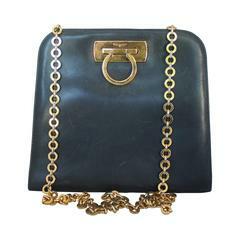 Salvatore Ferragamo, Circa: 1990's sand leather crossbody bag with two interior compartments one zippered pocket.